A look at a South Korean smart city that can outwit its inhabitants. And New York-based ARUP Principal Ashok Raiji explains how waste can be a thing of beauty. I CONSIDER myself pretty smart. So when my iPhone suddenly dies along with all my secret assignations and embarrassing emoticons, I don’t holler and tear my hair as many others might. I pick up the device and observe the blank screen with scientific dispassion. Then I holler loudly, tear my hair, and hurl the phone on the bed. I did the same to my younger brother for years and he turned out okay, if a tad addled, to eventually run marathons in sweltering 40C India. On a vast screen here you can theoretically spot where your children are located (through chip-implant bracelets) and where cars are parked. Not quite yet, but almost. Is this shades of Big Brother or just the next step in ramped up efficiency as smart-city advocates aver? At Cisco’s (newsroom.cisco.com) state-of-the-art office in the gleaming POSCO tower at one end of Central Park – yes, this is directly borrowed from New York – computers monitor the population’s movement, pulse, and needs. On a vast screen here you can theoretically spot where your children are located (through chip-implant bracelets) and where cars are parked. Not quite yet, but almost. Rude motorists begone. It’s a bit like a real-time The Sims virtual game with one difference. This is for real. Is this shades of Big Brother or just the next step in ramped up efficiency as smart-city advocates aver? After all, that’s where technology is leading us. The city’s pride and joy is its 18-hole (par 72; 7,413-yard) championship course run by the Jack Nicklaus Golf Club Korea (jacknicklausgolfclubkorea.com/). Designed by golfing legend Jack Nicklaus, in October 2015 this brand new course hosted the first ever Asian tee-off for The President’s Cup (USA vs the Rest of the World), a classic display of alpha male swagger, limber backs, strident national anthems, and beer, kicked off by former US President George W Bush and chaperoned by South Korea’s hugely popular President Park Geun-hye. More green and walking trails are available at two smaller parks downtown, Michuhol Park and Haedoji Park. Kohn Pederson Fox (www.kpf.com/ known for its iconic designs including the ‘bottle opener’ Shanghai World Financial Center (that houses the Park Hyatt), unsurprisingly wrought a similar towering marvel for NEATT (North East Asia Trade Tower), home to several Songdo biggies and with an unrivalled view that stretches for miles across the 1,500-acre development with a population of 36,000 that will house some 70,000 residents and three times as many commuters by 2020 when complete. Much of this is in LEED-certified buildings. Such is the focus on environment and sustainability here that the Green Climate Fund (news.gcfund.org/) brought its secretariat to Songdo. The World Bank has a presence here along with several multinationals and biotech and I.T firms. But there are other issues to consider. Ashok Raiji (Principal, ARUP), describes below how the liability of waste has been transformed into an opportunity with careful planning. Says Raiji, “new Songdo City is a new a sustainable planned city on the west coast of Korea about 60km from Seoul. The notion of a new city to relieve the urban density of Seoul and neighbouring Incheon City began in the late 1990s and early 2000s during which time the city infrastructure plan was being developed by the Incheon Free Economic Zone Authority (IFEZA). Recognizing that a sustainable city starts with green infrastructure, they went about planning and building many basic city services in an environmentally friendly way. “A new train connection between Songdo, Incheon and Seoul was planned and built; a new combined heat and power plant providing electricity and thermal energy to Songdo was developed; a new state of the art waste water treatment system was installed, and clean water from the waste treatment plant was distributed back to the city for non-potable water uses such as irrigation of parks. “Last but not least, a citywide automatic pneumatic waste collection and management system was conceived. Waste from cities has historically been a liability. Several decades ago most waste ended up in landfills creating pollution, adverse health impacts, and the notion of NIMBY (not in my back yard). When recycling took hold, the burden on landfills decreased as some of the waste (glass, metal, plastic and paper) was recycled into new products. 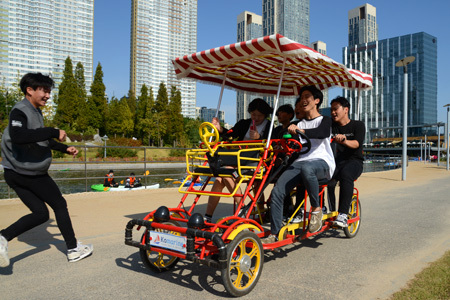 Songdo’s pneumatic waste collection system takes this to the next step. It’s more a giant leap. “The city has a network of underground pipes that collect household waste from residential, office and other buildings and transport it to a waste processing centre. There, items that can be recycled are separated and recycled, organic waste is taken to an incinerator where it is combusted to create energy, and the small amount of remaining waste is placed in a landfill. Incredibly, the entire waste management system is run by just seven employees. I agree that despite the best made plans, cities are organic entities and tend to follow their own course as populations grow and absorb new people, ideas, and habits. While not a 'smart city' in this sense, Singapore is another planned experiment of sorts. A very interesting read. Fascinating stuff. I'm not sure I want computers running the entire show but I do like the part about pneumatic waste disposal. It sounds terribly efficient. I should look in on Songdo on my next visit to Seoul.